De Rooy runs its activities in the specialized market. This requires profound knowledge from our drivers. De Rooy willingly invests in this. That is why we established the Academy. Experienced employees take care of appropriate training and introducing new colleagues in work. Before you start working for De Rooy as a truck driver, you will attend two-weeks training course. It always starts on Sunday. If you come from abroad, you will have a room within the area of De Rooy. On the first day, you will have a chat with the instructor to get to know each other. An employee of the Human Resources Department will make a brief introduction. The training begins with a driving test which should show what should be paid particular attention to during the training course. If you pass the test, you will carry on with the training, i.e. you will attend practical and theoretical classes. In the course of the practical training, you will learn how to load and unload the cargo, e.g. trucks. Apart from this, you will attend theoretical classes. Many subjects will be discussed there. For example, you will learn topography, and we will tell you to what things you should pay particular attention while loading and unloading the truck. You will learn everything about the operation of our board computer, prevention of damages, filling out the transport documents. With relation to all this, you will use the handbook included in the 'welcome set' which you will be given. The training will be held from Monday to Saturday from 8:00 a.m. to 8:00 p.m. From Monday to Friday, you will attend training in loading and unloading of trucks. On Saturday, you will accompany the load master. You will also have a chance to see how experienced drivers work, and learn some tricks from them. During the final days of the training, a planner will clarify some issues, and you will be told which mentor will be appointed to you for the coming weeks. Theoretical classes will be taught in the evening during one of the days of the training. You will be provided with meals during the whole training course. 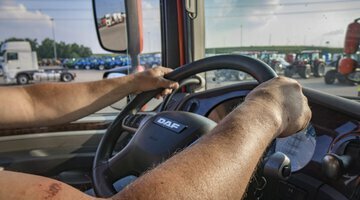 After two weeks of the training and if you get a positive grade, you will set off for the road with an experienced driver, your mentor who will accompany you during loading and unloading cargo at the client's. This way, after about six weeks, you will be able to drive by yourself with a dominating feeling of self-confidence. If you want to learn more about work for De Rooy or our Academy, contact us, please.